While some CAZ molecules, such as Bassoon and Piccolo, seem to be specifically carried by PTVs, other sets of proteins may be transported by distinct vesicles. A study using the SV protein VAMP fused to GFP for time-lapse imaging in cultured hippocampal neurons revealed a distinct type of mobile, vesicular packet that appeared to contain SV proteins, voltage-gated calcium channels and proteins related to SV endocytosis. 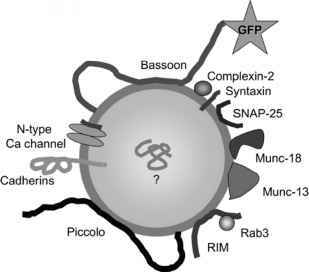 Such packets are stabilized at young synaptic contacts48. Electron microscopy revealed a heterogeneous population of vesicular and tubulovesicular structures at such sites. Therefore, various presynaptic components may be transported on such vesicles or packets of vesicles. Membrane remodeling may subsequently produce both the uniform SVs typical of mature synapses, and contribute to formation of active zone and periactive zone plasma membrane domains.